2019: Make plans to join us at the 2019 Empire Conference November 1-3 in Saratoga Springs, NY. Multiple CEs. networking, exhibit hall and more. Watch for updates. Watch the conference video. 2018: Much appreciation to all the participants in our Nov. 2-4, 2018 Empire Conference. Thank you for your role. See conference scenes and thank you to our supporters. Congratulations to honorees for NYDHA's 2018 Excellence in Dental Hygiene awards, presented at the Empire Conference. See awards presentations. Your New York State professional association for dental hygienists has a new name, new colors and a new logo: The Dental Hygienists' Association of the State of New York (DHASNY) is now the New York Dental Hygienists' Association (NYDHA). NYDHA produces a series of consumer-oriented factsheets that help people focus on maintaining good oral health. You can download these helpful factsheets here. 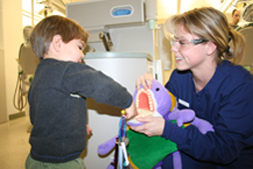 NYDHA recommends that children have a "dental home" by age one. Check out our educational campaign and resources for keeping young children oral healthy. Catch NYDHA members on Youtube videos talking about their different dental hygiene career choices.